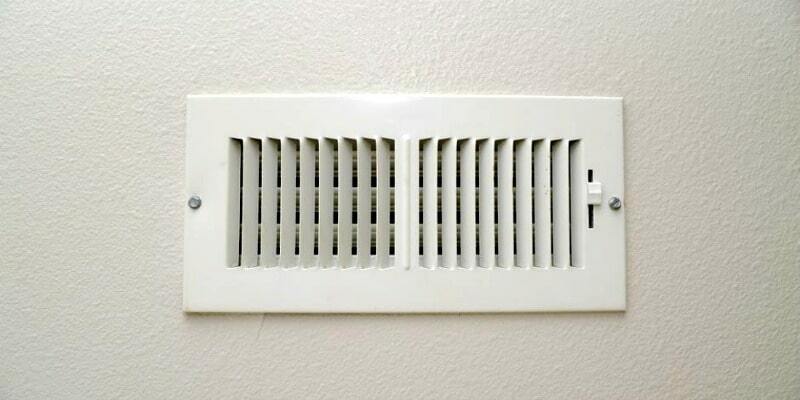 How To Clean Your Own Air Ducts and Save Money! Knowing how to clean your air ducts can save you a lot of money, since the professional duct cleaners charge a small fortune to do it. Is it a necessary household task? Probably not. Is it one that I do? You bet. Ever since the day I dropped an earring down a floor register and opened it to find a massive spiderweb occupied by an equally massive spider, I’ve made a point to clean my air ducts regularly. It lets me sleep at night. Also, I always notice less dust settling on my furniture after I’ve done such a cleaning. It just makes sense, doesn’t it? If you’ve got forced air coming out of a duct filled with dust, pet hair, Cheerios, or big ol’ hairy spiders, they’re bound to spread around a bit, right? Why put up with that? That’s why you need to know how to clean your air ducts. Fortunately, cleaning your air ducts isn’t that difficult to do if you use the right tools and make a point of following directions. No, you won’t get as deeply into your duct system as a commercial company will. That’s fine: most of the debris in your ducts gathers toward the registers, anyway, and you can reach those spots on your own. • You can use this method to clean cold air returns, too. • If you have pets that shed a lot, or kids who like to drop things down floor registers, you might want to consider installing vent register filters. • Be sure to change your HVAC’s air filter after you clean your ducts. Step 1: Cleaning the duct walls. Floor registers are easy to remove — lift them up. Wall registers may have to be unscrewed using the cordless drill. Either way, remove and wash the vent in a sink of hot, soapy water, then rinse and let them air dry. Metal registers can be cleaned in a dishwasher, though if you’ve painted yours, you should probably wash them by hand. Once the registers are out of the way, attach the dryer vent brush to the end of your cordless drill. Make sure it’s firmly attached before feeding it into the duct because you do not want the brush detaching and getting lost in your duct system! Turn the drill on and let it whip the brush around in your duct. With the drill still running slowly, pull back while the brush cleans the walls of the duct as you pull the brush out. Turn the drill off when the brush reaches the final 2 feet, or you’ll fling dust everywhere. 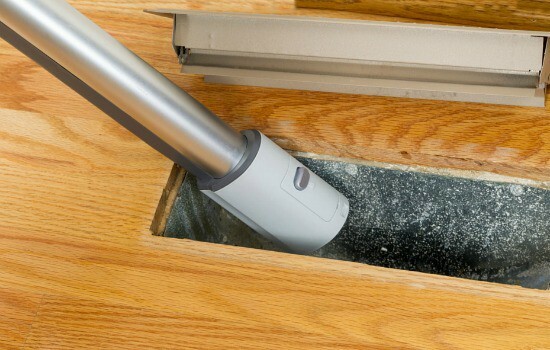 Once you’ve removed the dryer vent brush from your duct, stick your vacuum cleaner hose with the dust brush attachment down into the duct. (Again, make sure that brush is on firmly!) Now, vacuum up any dust or other gunk you’ve dislodged, then give the dryer vent brush a quick vacuum before moving onto the next duct. Step 2: Cleaning the rest. 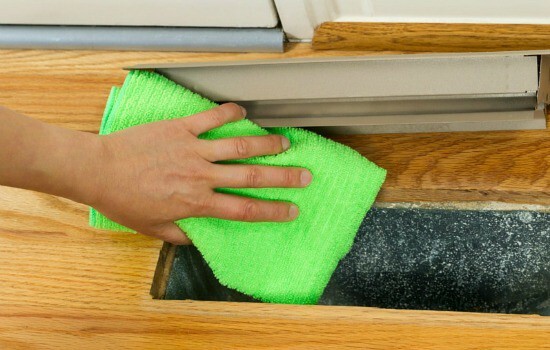 Using a damp microfiber cloth, reach down into the duct as far as you can and wipe the interior clean. You’ll want to rinse the cloth repeatedly because chances are you’ll find a lot of dust and gunk in there the first time you do this. For particularly stubborn dirt it’s okay to spray a homemade all-purpose cleaner on the cloth before wiping. 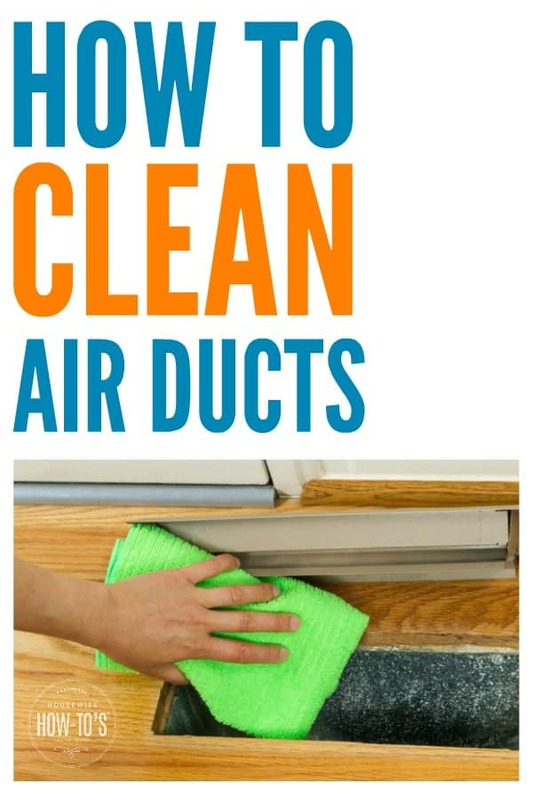 Wipe the area around the duct, including the floor or wall. Return the clean register vent to place, and you’re done! 1 Senior lady here who doesn’t trust most vendosr who come to the home as we have been ripped off so many times. This method won’t get all the way from floor level back to the furnace/HVAC unit, as the professionals say they do. But, since it doesn’t involve forcing water and steam through the system, it won’t cause drips or mold. How does the dryer brush attach to the cordless drill? It looks like it has a handle on it not a drill bit end. Ugh, they changed the product listing since I first wrote this entry. I’ve updated the link to the brush in the entry. It’s this one. Where can I purchase a dryer vent brush ? Hi Nana, P. I bought mine from Amazon. This is the one I bought. Often use the vacuum hose but have not heard of a dryer vent brush, would do a much better job of cleaning. The dryer vent brush is fantastic. It works on refrigerator coils, too!